Since 1984 our market has been noted as one of the finest on the East Coast. We have over 150 quality dealers in a beautiful climate controlled complex. Our dealers strive to keep the market neat and full of quality antiques & collectibles at the lowest price possible. Mt Vernon Antique Center, formerly known as ‘Thieves Market’ is the oldest antique mall in the U.S. We feature 27 dealers offering a broad variety of antique furniture, small collectibles, jewelry, Persian rugs and many other unusual items. This shop is full of fun discoveries and bargains, including furniture, paintings, antique books, vintage advertising items, decorative objects, and neat collectibles. Potomac West Interiors and Antique Gallery in Del Ray brings you classic American and European furniture from the 19th and 20th centuries. With over 35 independent dealers, we are continually changing our inventory to bring you truly unique pieces to enhance your home. You will find a broad selection of antique and estate jewelry from the 18th and 19th century, Georgian to Victorian, through Art Nouveau and Art Deco. The store is especially known for original platinum and diamond rings of the early 20th century. We specialize in fine 18th and 19th century furniture, paintings and accessories. Everything in our constantly changing inventory is fully guaranteed to be as represented. We clearly display prices and complete information on the age, origin and condition of each item. We are an exceptional antique shop located in the heart of Old Town that specializes in sterling silver flatware and hollow ware, gold and platinum antique and estate jewelry including Art Deco & Victorian periods. Be prepared to find 19th century paintings, sterling silver, 18th to 19th European carved and American furniture, fine European porcelains, sculptures, victorian and estate jewelry, fine mirrors and, of course, all your favorite collectibles. We have a full range of high quality antique furniture of 18th and 19th century American and English, including chests, tables, work stands, chairs, sofas and high case pieces. We also have an expanding collection of American and English fine art. With a large selection of frames and expert professional advice, we offer high-quality framing for any budget. We also offer custom installation and hanging for your pictures. We offer a wide variety of framed and unframed works for any budget. The gallery's large inventory includes a broad range of subject matter and medium. As a full service gallery, we will research many art solutions for your home or office. Each location rehangs once a month, offering a fresh look each time you visit. Our goal is to provide you with great art and custom picture framing at competitive frame shop prices. Our art gallery is filled with a diversified collection of original oil paintings, watercolors and limited edition prints. We can also have artwork brought into the gallery or commissioned. At Old Mill Frame Gallery, the art is in the framing. We will help add beauty to your prints, paintings, photographs, collectibles, military medals and more using state-of-the-art framing equipment. The gallery also sells high-quality porcelains, limited-edition prints and other works. Proprietor Chuck Kipp has been here since 1979, and his years as an artist help him provide quality framing services to his customers. The store also has a nice selection of jewelry including sterling silver earrings and bracelets. Stop by today and check our great selection of both designer and moderate labels. We carry women's apparel, fashion accessories, handbags, shoes, jewelry, home décor accessories and much more. Urban looks in a suburban setting. We carry a nice selection of beautiful clothes not typical in the mall stores, as well as Brighton accessories and various costume jewelry and shoes to complete your outfit. For bright, exciting, and comfortable clothes, Keego Clothing should be your first stop. 100% cotton outfits and quilts, unusual gifts and accessories — all designed in the vibrant colors and patterns from South Africa. The Big Screen Store is in a class by itself. We carry only the best brands and even have their hard to find better models. We can demonstrate everything properly, so you know how to operate your big screen TV when you get home. Come visit the finest audio/video showroom in the area. Our specialties are media rooms, family room entertainment systems, whole home music systems, dedicated home theaters and home automation and lighting control. All items are unique and handcrafted and the shop has quickly become the place to get a one-of-a-kind gift or piece of jewelry. Online shopping and on location by appointment for unique gifts for home decor, bath, body and skin care, candles and aromatherapy, crystals, sun catchers, garden and patio items, handbags, purses, bags, totes, home decor, pampered pets and much more. Barefoot Books creates carefully crafted children's books, children's CDs and children's gifts that spark imagination, exploration and creativity. The company began as a home business in 1992 and is now an international business. 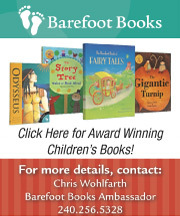 Barefoot Books are sold via several outlets and through the company's "Barefoot Books Ambassador" program. Ambassadors are individuals who sell Barefoot Books products through home parties, community and school events. Every corner of our shops features a different famous line of collectibles. Find special touches to make your house a home and gifts for all occasions. We believe our products will help you enjoy happiness, warmth and peace right in your own home. Outside you'll find seasonal plants, water garden supplies, garden ornaments and more. Inside are traditional and contemporary furnishings, including lamps, pillows, mirrors, chandeliers, plates and glassware, bathroom accessories, nursery items and a smattering of wearable things. We offer a selection of many one-of-a-kind items handcrafted by local artists including original paintings, photography, jewelry, ceramics, glassware, hand-woven baskets, mosaics, handmade baby gifts, bath products, cards and many other unique gift and home decor items. T & K Treasures is a specialty retail gift shop with products made in the USA and by local artists. We have gifts for men, women and children. Soy candles, jewelry and artwork are just some of the many items we carry. At Wit's End you will find beautiful jewelry, distinctive accessories, eye-catching home furnishings, unique furniture, delightful personal care products, charming touches for your garden, and whimsical gifts small and large. Our full-service store offers a full line of mounted jewelry, loose diamonds, watches and gifts, as well as in-house engraving, repair and design work. Our experienced staff helps take the guesswork out of jewelry purchases and free estimates are available on repairs and engraving. 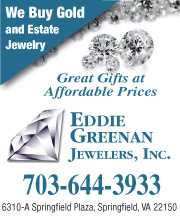 Eddie Greenan Jewelers, with over 25 years experience, specializes in wholesale, gold, silver and estate jewelry. Top dollar is paid for gold. They provide the best in customer service and offer watch repair, including Rolex repair, designer jewelry, pearls and much more. Unique custom designed jewelry you will not see elsewhere. We have a wide array of gems that are available to customize your own very personalized settings. Other fine jewelry is also available. Need jewelry repair? ... Consider it done. Behind every gift is the inspiration of passion. A feeling more significant and memorable than any combination of prized metal or treasured gem; no matter how exquisite they are. We believe in the power of passionate love; let our jewelry express your passion today. We are a full -service fine jewelry and watch repair boutique located in the heart of Annandale. Come in and see our wide selection of carefully crafted and designed jewelry. Whether you’re searching for the perfect engagement ring or a gift for that special someone, we have the diamonds and gems that warm any woman's heart. Known as "The Hardware Department Store" because of our extensive inventory, we have become a favorite among area customers. Our wide selection includes hardware and tools, paint, housewares and gifts, patio furniture, lawn and garden supplies as well as plumbing and electrical. The UPS Store offer consumers and small businesses a wide range of products and services in one convenient location. Our range of products and services includes: packing, shipping, document services, mailboxes and postal services. 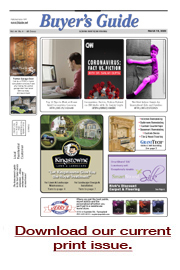 We offer customers old-fashioned, personalized service, as well as, the latest in products and equipment. You will find everything you need for your home: painting, plumbing, electrical, garden and general hardware, and we are your one-stop shop for high-quality Weber grills.